Interim coach Steve Spagnuolo said it was a "gut" feeling to return Manning to his starting role, one week after he was benched by head coach Ben McAdoo. "Eli Manning will be the quarterback for this football team in this game," Spagnuolo said in comments looking ahead to Sunday's game against the Dallas Cowboys. "The 'Why Eli?' All I can tell you is this," he said. "When (owner) John Mara and I talked, one of the first things he asked was about the quarterback situation and I said, 'John, my gut right now is that Eli should be the starter'." "I told Spags that I want to play and be the starting quarterback," he said. 'I wanted him to know that I’m happy that he went with that decision and that he has faith in me." 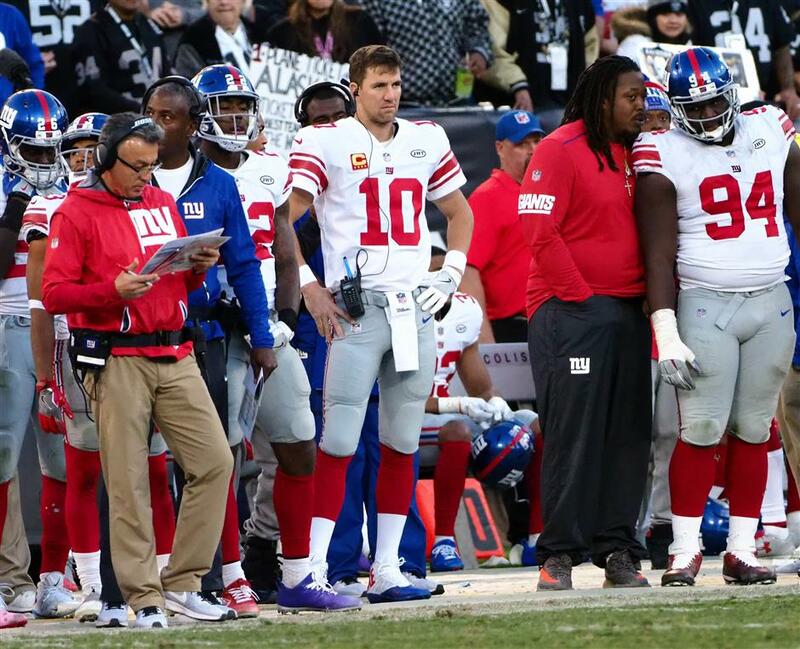 The QB shakeup didn't help the Giants, who fell to 2-10 with a 17-24 loss to the Oakland Raiders last weekend. A week after McAdoo's ill-fated move sparked speculation that the Giants' "Manning Era" could be over, the 36-year-old quarterback said he was eager to restore the struggling club to contender status. "This is all I know, playing for the New York Giants," he said. "I never want to change that. We're going to compete and work hard. We're going to try and beat the Dallas Cowboys." New York Giants quarterback Eli Manning (center) stands on the sideline during the fourth quarter of their NFL game against the Oakland Raiders at Oakland Coliseum in Oakland, California, on December 3, 2017. Manning was benched in favor of Geno Smith.